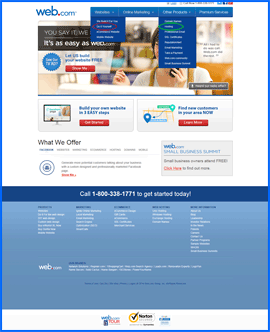 Perhaps the best-known web hosting company in the world, Web.com specializes in designing, building, hosting, and managing websites for small-to-medium-sized businesses, non-profits, and consumers. Publicly traded on the NASDAQ exchange, Web.com’s 2,000 employees serve approximately 3,200,000 customers worldwide. With access to the resources available to a major corporation, we fully expected them to have perfected small-business hosting. After our Web.com experience, we can say with a high degree of certainty that they have not. The company has a lot to learn about usability. Unfortunately, Web.com has earned the NCM Online designation of NOT RECOMMENDED. Web.com specializes in website hosting services that include design, development, management, and online marketing. Their offerings range from complete done-for-you agency managed and promoted websites to do-it-yourself shared hosting packages. Screenshot of Web.com homepage. The plan we originally purchased is circled in red. The plan we should have purchased is circled in green. Click to enlarge. While $22.95 per month seemed expensive for a basic shared hosting plan, we proceeded with the purchase and checked out. We next uploaded the NCM Test Site (click for sample test site), and then set up the Dotcom Monitor server speed and reliability testing. It was only after testing was completed that we compared the “Website Builder” plan recurring price to that listed on our pricing and features page. It was then we realized that we had purchased the wrong plan. The lowest-cost shared hosting plan is not listed beneath the “Websites” button on the Web.com homepage. It is listed as “Hosting” in the dropdown menu beneath the “Other Products” button (see screenshot above right). Screenshot of Web.com Customer Support Portal. Click to enlarge. Clicking the “Hosting” link directs the visitor to the Unix hosting page. The page features three shared plans: Essential Hosting priced at $9.96 per month with annual term; Professional Hosting priced at $13.29 per month with annual term; and Premium Hosting priced at $29.13 per month with annual term. All three include a free domain name (first year only). The Essential Hosting plan is designed for small business owners who require only a limited web presence, as well as webmasters who anticipate a lightly trafficked site that does not consume an extraordinary amount of resources. It includes 300GB of disk space, unlimited data transfer (bandwidth), 10 e-mail accounts, 25 FTP accounts, and 25 MySQL databases. The Professional Hosting plan is designed for small- to medium-sized business, as well as webmasters who anticipate a well-trafficked site, or a site that consumes the type of resources often associated with the use of video, audio, and other multi-media file types. It includes 500GB of disk space, unlimited data transfer, 25 e-mail accounts, 50 FTP accounts, and 50 MySQL databases. Screenshot of Web.com proprietary control panel. Click to enlarge. The Premium Hosting plan is designed for small- to medium-sized business that require management of multiple well-trafficked sites, as well as webmasters who anticipate the consumption of significant resources via the integration of numerous multimedia files and/or extraordinary amounts of web traffic and user interactions. It includes unlimited of disk space, unlimited data transfer, 25 e-mail accounts, unlimited FTP accounts, and unlimited MySQL databases. As is our practice, we selected the lowest-cost plan — Essential Hosting — and proceeded to make our purchase. The 4-step checkout process is simple enough, but not quite as fast as it could be. We did however, take exception to the fact that monthly payment plans are not billed monthly, but every four weeks (28 days). As there are 13 four-week periods in a year, purchasing a monthly plan will result in 13 payments per year — rather than the anticipated 12. We find this type of billing to be a questionable and somewhat deceptive business practice. As there is no PayPal payment option, we paid via credit card and submitted our order. The “Getting Started” e-mail arrived a few minutes later. Unfortunately, it did not include the information required to set up our test site quickly. It did however, include a link to the “Customer Support Portal” and the login information. While Web.com refers to their main hosting interface as a “Customer Support Portal,” it has little to do with support services. 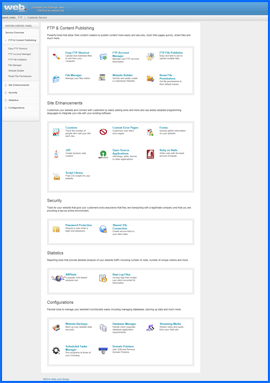 It is essentially, the hosting account dashboard (see screenshot above right). 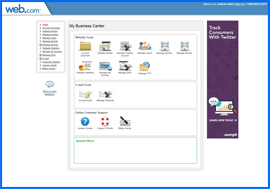 To add to the confusion, the page is titled, “My Business Center.” Not particularly user friendly, it does provide access to the control panel via the “Manage Hosting Account” icon and link. Web.com 8/17/14–8/26/14 Uptime Test Results Chart. Click to enlarge. Web.com shared Unix plans utilize a proprietary control panel (see screenshot above right). Not as easy to use as cPanel or vDeck, it requires some searching to perform a number of basic site management functions. Further, we had great difficulty in locating the nameserver settings, and only managed to do so by searching the “Answers Center” after we had submitted a support ticket. Next, we proceeded to upload our simple 1-page test site. 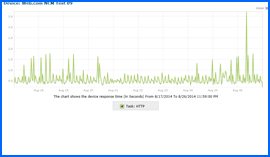 We then set up page-load speed and uptime testing. Utilizing the services of Dotcom Monitor, all web hosting services reviewed by NCM Online are subjected to 10-day uptime and page-load speed testing. Beginning on 8/17/14 and concluding on 8/26/14, our Web.com-hosted website was checked for uptime and page-load speed every fifteen minutes. 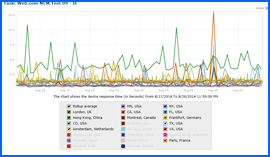 Web.com 8/17/14–8/26/14 Speed Test Results Chart. Click to enlarge. In all, 951 server uptime checks were performed over the course of the 10 days. All 951 were successful, earning Web.com a 100% uptime rating (see uptime test results screenshot above right). Of the 944 page-load speed checks performed between 08/17/14 and 08/26/14, all 944 were successful. The average page-load speed from the 13 worldwide locations was 1.3705 seconds, and only 0.9423 seconds from the 7 U.S. locations (see speed test results screenshot right). While not the fastest host reviewed to date, the recorded server speeds were well above average. It is important to note that unlike other shared hosts, Web.com does not permit you to install WordPress within the root directory of your website. It may only be installed within a folder. Yet another reason why we would never consider Web.com for our own hosting needs. Despite the technical merits of their shared web hosting service, numerous ease-of-use issues prevent us from endorsing Web.com at this time. Web.com has earned 3.5 stars and is not recommended by NCM Online. Cheap website hosting company price comparisons based on 1-year term list price before coupon/promo codes or limited time/introductory offer discounts. These are the renewal rates for the second year of hosting. To ensure that you receive the most affordable Web.com pricing possible, please visit our Web Hosting Coupon Codes page for current discounts and special offers before making any purchases. Web.com offers small businesses a broad range of Internet services so they can compete and find online success. The firm goes beyond being a global domain registrar. Its subscription-based solutions are geared to both new and seasoned small businesses. These solutions include affordable website design and administration, online advertising campaigns, search engine optimization, ecommerce solutions, local leads for sales, mobile and call center services, and social media. The company utilizes production efficiencies that allow them to offer high-level Web services effectively and inexpensively to their clients. These techniques include the creation of an exclusive group of software for management and publishing, workflow process automation, and specialized workforce development and administration. The depth and flexibility of Web.com’s offerings allows it to meet a spectrum of client business needs, from helping a new venture acquire a domain name and establish a website to providing experienced firms with more high-level functions or ecommerce. Web.com is committed to helping small businesses achieve online success. The company’s 30 years of experience and the more than 3 million subscribers demonstrate that it knows how to help small web businesses grow and prosper. The firm offers many simple and helpful solutions for growing business. The company makes every effort to understand every client’s unique needs, so they start with an in-depth customer interview before building every website and setting up each ecommerce solution, Social Media Page, and online marketing agenda. The company utilizes this individualized information and 30 years of experience to create a professional web image for each customer. Web.com hires designers and copywriters who are experts at search engine optimization for Yahoo!, Google, Bing, Facebook and many others. By combining website building with tailored marketing, Web.com ensures that a business will be found. The company also meets the needs of clients who already have websites. Its Gorilla Online Marketing program allows customers to quickly and cost effectively market their businesses online in hundreds of different places. The company understands that its subscribers need to keep their websites and social media interesting and up-to-date, so personnel is constantly available to make revisions, post online comments or freshen-up content. Customers that like building things on their own have access to patented online builder and website tools. These are designed to allow small businesses both to construct high-quality websites and make their presence visible online. Web.com, which is based in Jacksonville, Florida, has been assisting small businesses since 1997. The company went public in 2005. Through growth and acquisitions, they have increased subscribers from approximately 50,000 in 2005 to in excess of three million at the end of 2012. In 2013 the Deloitte Fast 500 Technology list recognized the company as one of the fastest growing technology companies in North America for the fourth consecutive year. High standards are set by the Board of Directors of Web.com Group, Inc. for the company’s officers, directors and personnel. Sound corporate governance is an important part of this philosophy. The Board of Directors recognizes its duty to serve as a wise fiduciary for stockholders and to watch over the Company’s business management. The Board of Directors follows standards and procedures set forth in guidelines in order to fulfill these duties. These guidelines are updated when the Board determines it is in the Company’s best interests or when required by new laws or regulations. This video tutorial demonstrates the installation of WordPress on an Web.com shared hosting account using the proprietary control panel and applications installer.